We’ve put together a travel guide about all the top things to do in Aberdeen Scotland. Aberdeen, nicknamed the Granite City, is Scotland’s third largest city. Although less known than Edinburgh or Glasgow, Aberdeen is a great city to visit if you are interested in seeing another side of Scotland. We recently spent several days exploring Aberdeen and found that the city has a lot to offer visitors. Aberdeen has powerful architecture, beautiful gardens, charming historical districts, interesting museums (most of which are free! ), good restaurants, internationally known golf courses, fun festivals, and even a beach! 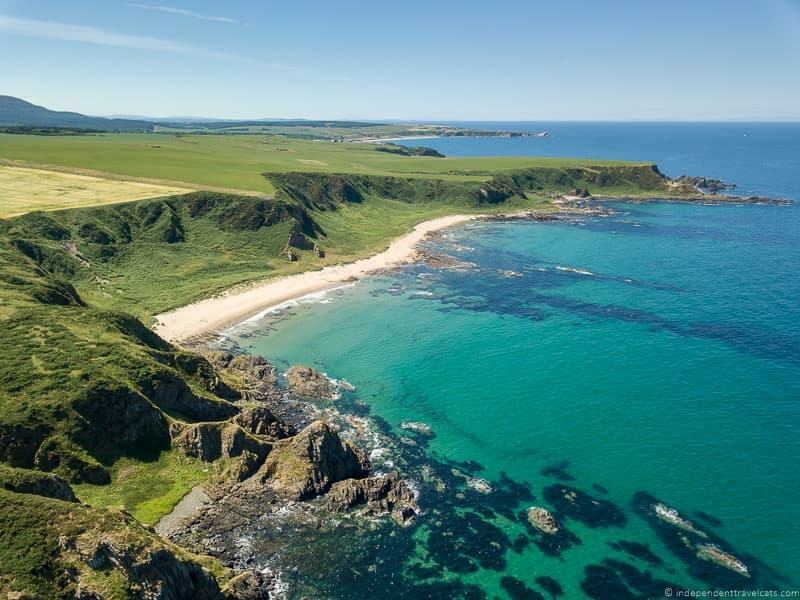 The wider area of Aberdeenshire is home to whisky distilleries, dozens of castles, the Cairngorms National Park, and some of Scotland’s best golf courses. First, we’ll share all you need to know to plan your visit to Aberdeen including how to get there, how to get around, and where to stay. Then we’ll share our guide to Aberdeen attractions, highlighting all the top things to do in Aberdeen, from central Aberdeen to the surrounding area. Best time of year to visit Aberdeen? How many Days should I Spend in Aberdeen? Where to Stay in Aberdeen? Where to Eat in Aberdeen? How to Save Money in Aberdeen? Before we begin with all the attractions, here is some travel information that may come in handy. This includes advice and tip about getting to Aberdeen, getting around Aberdeen, where to stay in Aberdeen, and when is the best time of year to visit the city. Aberdeen is located in the northeastern part of Scotland, within the Scottish Highlands. It is a coastal city with the North Sea (part of the Atlantic Ocean) located along the eastern side of the city. By Plane. There are multiple flights a day in and out of Aberdeen Airport from destinations across the UK and Europe, and this can be a relatively cheap way to reach the city, especially if you book in advance with a budget airline. Aberdeen airport is 30 minute drive, bus ride, or taxi ride from the city centre. The next closest airports are Inverness Airport and Edinburgh Airport which offer more UK and international connections. By Train. Aberdeen is well-connected by train from locations throughout England, Wales, and Scotland. You can check ScotRail and London North Eastern Railway for local train services, routes, and to purchase tickets. If you are interested in taking an overnight sleeper train (runs between London and Inverness), you can check the Caledonian Sleeper route and schedule as some services stop in Aberdeen. By Bus. 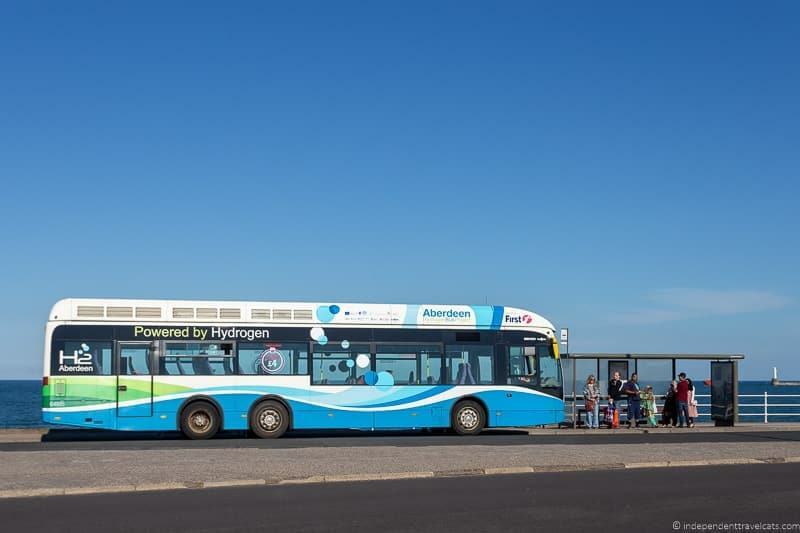 If you are in the UK and would rather travel by bus, there are daily coach connections to Aberdeen from a number of cities. Generally it takes longer to travel by bus but it may save you money compared to train fares or rental cars prices. You can check National Express for coach connections and prices. By Car. For drivers, Aberdeen is located about 105 miles from Inverness (about 2 hours, 45 minutes),125 miles from Edinburgh (about 2 hours, 45 minutes), 150 miles from Glasgow (2 hours, 45 minutes), 350 miles from Manchester (about 6 hours), and 545 miles from London (9 hours, 20 minutes). Aberdeen is an easy city to get around on foot and by public transit. The city center attractions can be explored on foot. The locations outside the city center such as attractions in “Old Aberdeen”, the University of Aberdeen, Footdee, and the Gordon Highlanders Museum can easily be reached by public bus, taxi, or car. We’ll provide some guidance throughout the article about how far attractions are located from the city center to help you best plan and navigate the city. It is easy to drive around Aberdeen but parking can be difficult to find around the city center and university areas, so we’d recommend using public transit or walking if possible around these areas. If you need to call a cab while in Aberdeen, we recommend using this UK taxi comparison service to find the best rate. If you are planning to use the bus in Aberdeen more than once or twice, we recommend checking out the GrassHopper ticket. The ticket is economically priced to allow for unlimited use of many of the local bus services for 1 day, multiple days, or even a week. 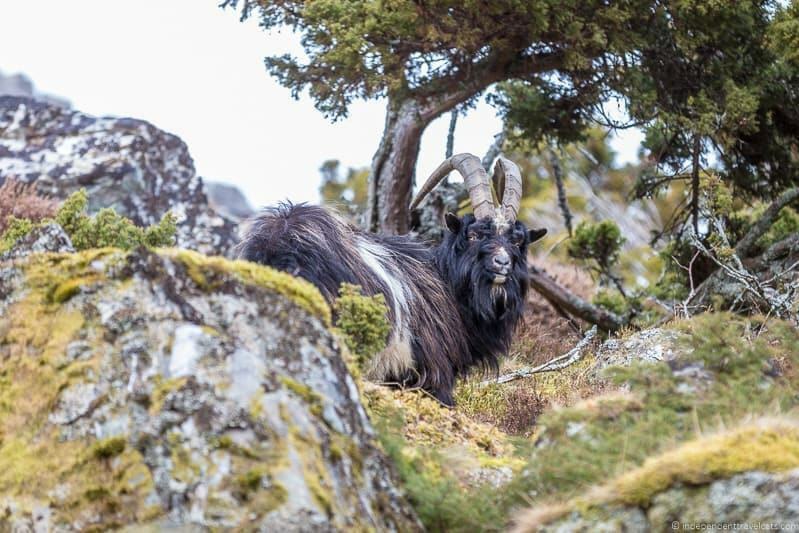 Most visitors will probably just need the ticket that covers the main zone around Aberdeen, but you can also get tickets that allows for travel around the full area of Aberdeenshire if you are planning some day trips. 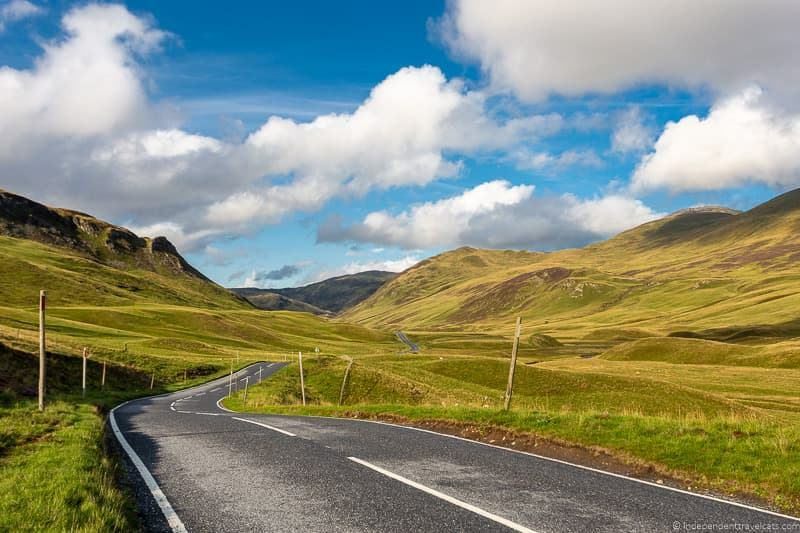 If you are wanting to visit locations outside of the city such as castles, golf courses, whisky distilleries, or the Cairngorms National Park, the easiest way to explore is by car. However, you can also get to many places via bus and there are also some guided tours you can take from Aberdeen to places like Balmoral Castle, Royal Deeside, the Speyside whisky distilleries, and Loch Ness. Being a city, there is a lot to do in Aberdeen at any time of the year, with multiple indoor and outdoor attractions. 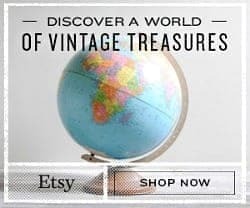 Of course, the best time for you will vary depending on your interests as you may want to catch a certain festival or visit during a particular season. In general, our favorite time of year to travel in Scotland is May, June, and September. The weather is generally decent and the attractions are not too crowded. However, Aberdeen is much less busy with tourists than Edinburgh, so it is a pleasant city to visit in terms of crowds year-round. 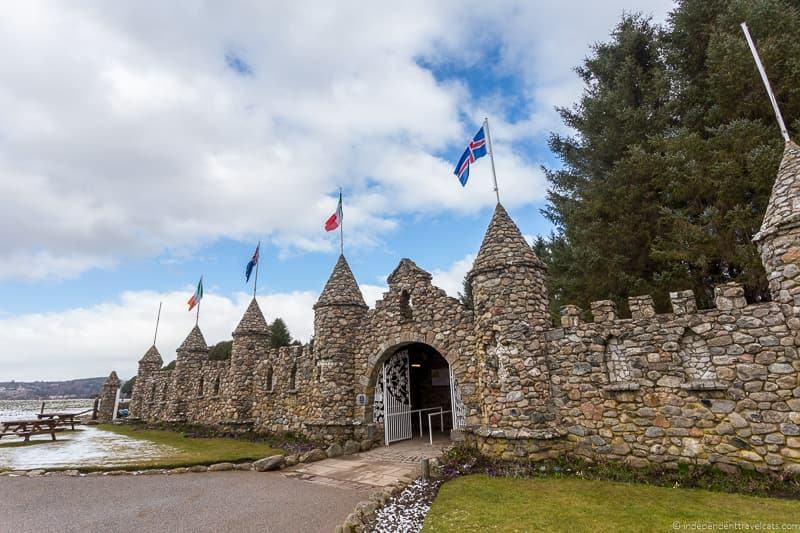 Most attractions within the city are open year round, although many of the castles in Aberdeenshire have seasonal hours and many close during the winter. In terms of weather, it is generally warmer in the summer and colder in the winter, but it rarely gets hot. However, the marine climate means that it can have cooler summers and warmer winters than other areas of Scotland. Weather is fickle in Scotland and rain is a strong possibility year round. We’d suggest checking the weather forecast before you visit, and be prepared for variable weather by bringing plenty of layers and rain gear no matter when you plan to visit. We’d recommend spending at least two days in Aberdeen to see the city highlights, but three days would be even better to really get a feel for this city and perhaps explore a bit of Aberdeenshire. So a long weekend in Aberdeen would be ideal. Of course, if you can stay for longer as there is plenty to do in the city and the rest of Aberdeenshire, so you won’t have trouble filling your time! 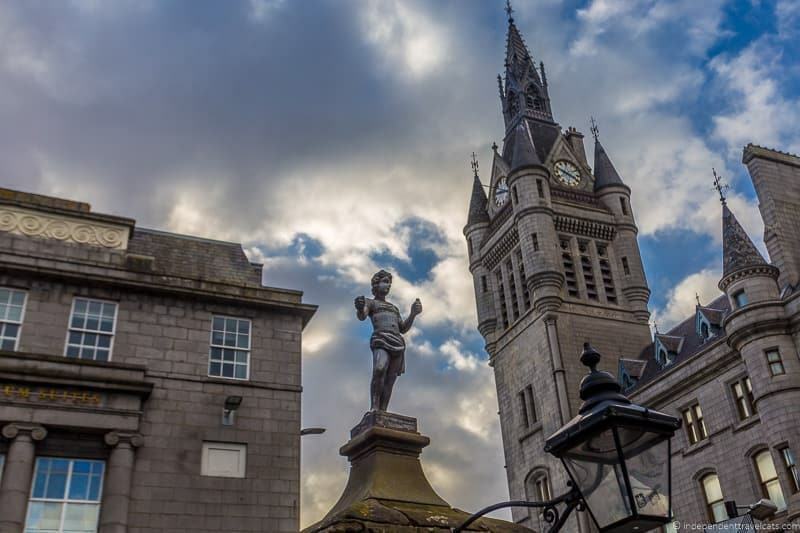 We’d recommend staying in the city center of Aberdeen to maximize your time in Aberdeen. Many of the city’s museums, attractions, theaters, and popular restaurants and bars are located in or near the city center. Most of the city’s festival events also take place in central city locations. 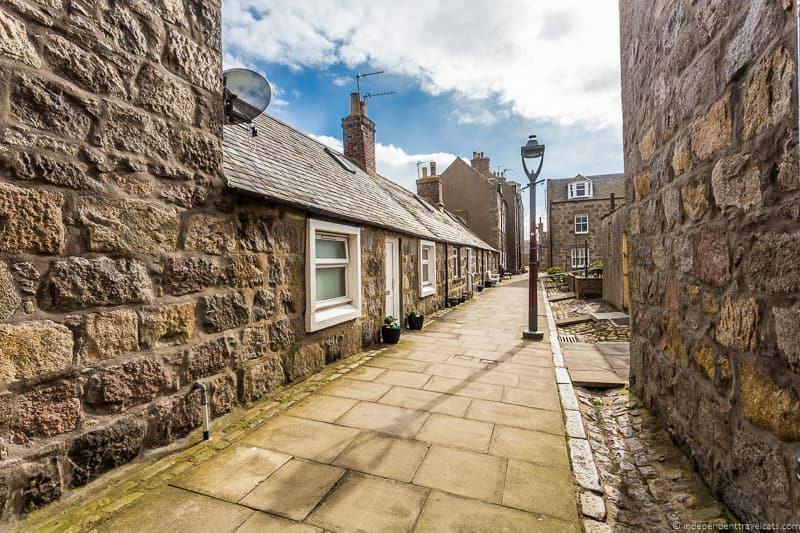 However, Old Aberdeen (around the university), the West End, and the harbor area are also nice places to stay, depending on what you want to see and do in the city. There is a wide variety of accommodation options in Aberdeen that should suit any type of traveler, including hotels, apartments, guest houses, and hostels. If you want to stay in the central area, you can check out this list of lodging located in the city center. If you are looking for a well-rated city center hotel, we recommend checking out Residence Inn, the Carmelite Hotel, The Station Hotel, and Jury’s Inn. For centrally located B&B’s you might want to look at Bimini Guest House and Lochnager Guest House. In terms of hostels, the well-rated Soprano Hostel has a great central location, offering shared dormitory rooms as well as private rooms. For those looking for a good value apartment, we recently stayed in this apartment hotel, which came with a kitchenette (option to cook when we wished), free breakfast, work space, and free parking. If you are looking for a special place out of the city center, you might consider staying in these former 19th century lighthouse cottages near Aberdeen Harbor (4 night stay minimum during most of the year). You can also check Airbnb listings (get $30 off first booking if you sign up). If you have a car and don’t mind staying a bit outside the city there are some really nice Scottish country house hotels nearby which include the Marcliffe House & Spa (also a good place for afternoon tea), MacDonald Norwood Hall Hotel, and the Ardoe House Hotel & Spa. One of the things we were most surprised about in Aberdeen was how much we enjoyed the food. The city offers a range of eateries where you can find everything from vegan dishes to pub fare to fresh seafood. So whether you are looking for a quick bite on the go or a nice dinner out, you should be able to find a restaurant that suits. 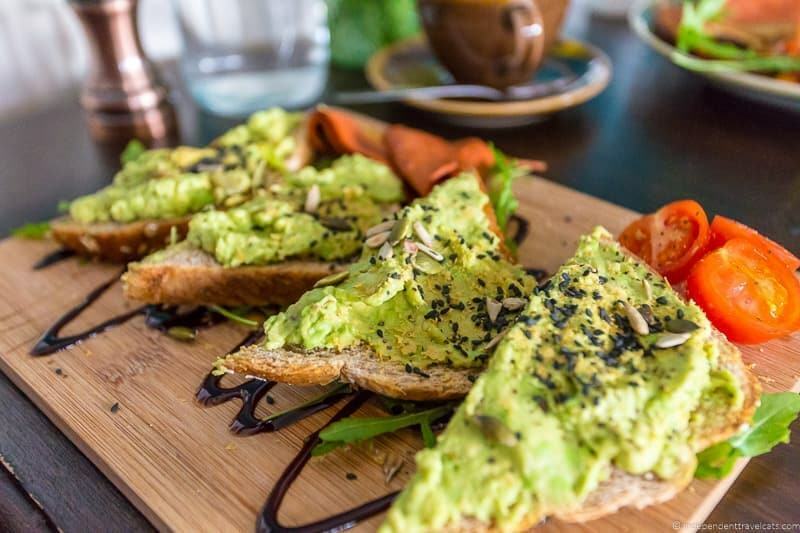 Laurence has put together this guide to our favorite restaurants in Aberdeen which provide loads of dining suggestions for those visiting the city, whether you are looking for a vegan breakfast, a seafood lunch, a pub meal, or a fancy dinner out. Aberdeen is a wealthy city that has earned its riches in recent years from the energy industry, particularly from North Sea oil. Although it can be an expensive city to live in, it is not an expensive city to visit. Most of the city’s museums and major attractions are FREE! Almost all the city’s museums, art galleries, parks, and gardens are free to visit. Those museums and attractions that do have entry fees, such as the Aberdeen Science Centre and Gordon Highlanders Museum are reasonably priced. The three biggest expenses for most people will be lodging, food, and evening entertainment. In terms of lodging, it is easy to find budget and good value accommodation throughout the city, even in the city center. If you are on a tight budget, you can check out local hostels like Soprano Hostel (city center) and the Aberdeen Youth Hostel (West End). The local population includes both university students and wealthy oil-rich millionaires, so you can find food options that vary from cheap eats to pub food to fine dining. You can also save money by staying in an apartment and cooking some of your own meals. You don’t have to spend a lot of money to enjoy some of the local evening entertainment. You can often find free live music at pubs and free or inexpensive events at or around the University of Aberdeen (check this calendar for university specific lectures, concerts, and events). Evening entertainment can be anything from live music at a club to a football match at Pittodrie Stadium to premium tickets to a performance at His Majesty’s Theatre. During the city’s many festivals, there are normally both free and ticketed events of varying price points so check the festival schedule in advance to plan your visit and pre-purchase tickets. There are currently no discount passes in Aberdeen, mainly because most of the attractions are free to visit. But if you are planning to use public transportation, you may save money using the previously mentioned GrassHopper ticket. Also if you are planning to visit the Royal Deeside area, you might want to check out this Royal Deeside discount passport. For more information about the area, we’d recommend checking the VisitAberdeenshire official website, which has loads of information about visiting Aberdeen and the surrounding Aberdeenshire area. We also recommend taking a look at this suggested 2 day Aberdeen itinerary that Laurence put together based on our own visits. Once in the area, we also recommend stopping at the city visitor center to pick up brochures and maps, as well as to ask about festivals and events. If your travels are taking you to other destinations in Scotland, we live in Scotland and have loads of posts on Scotland across our two travel blogs and you can find them all here and here. 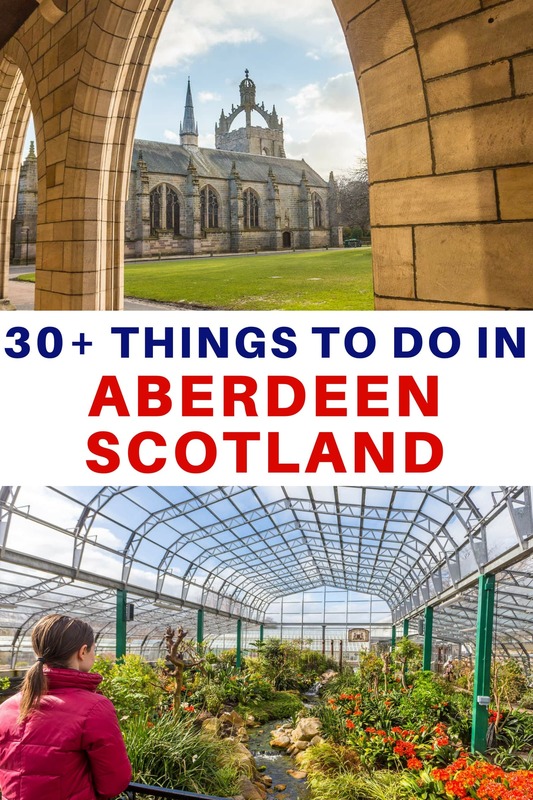 These include an Aberdeen itinerary, things to do in Edinburgh, information on visiting the nearby Cairngorms National Park, things to do in Glasgow, and tips for planning a North Coast 500 road trip. 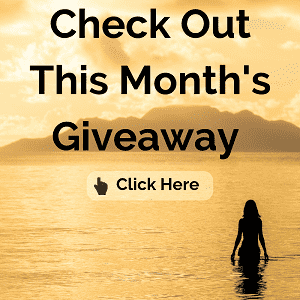 If you have a question about an upcoming trip to Scotland, just leave us your question in the comments section at the end of the post and we will happily try to help. Use this list to choose the attractions of interest and put together your own personalized Aberdeen itinerary. We’ve divided attractions by those located in central Aberdeen, those located in Old Aberdeen, those located outside the city center, and those located within the wider Aberdeenshire area. Luckily many of the top things to do in Aberdeen are located within central Aberdeen and can be reached by walking or by a short trip by bus, taxi, or car. If you are able, especially if the weather is pleasant, we recommend walking to get around the city center. All the attractions in this section are located within a 20 minute walk from St. Andrew’s Cathedral on King Street (I’m using the cathedral as the center point of the city to measure distances). Most are located within a 10 minute walk or less, making it easy to visit several attractions in one day. 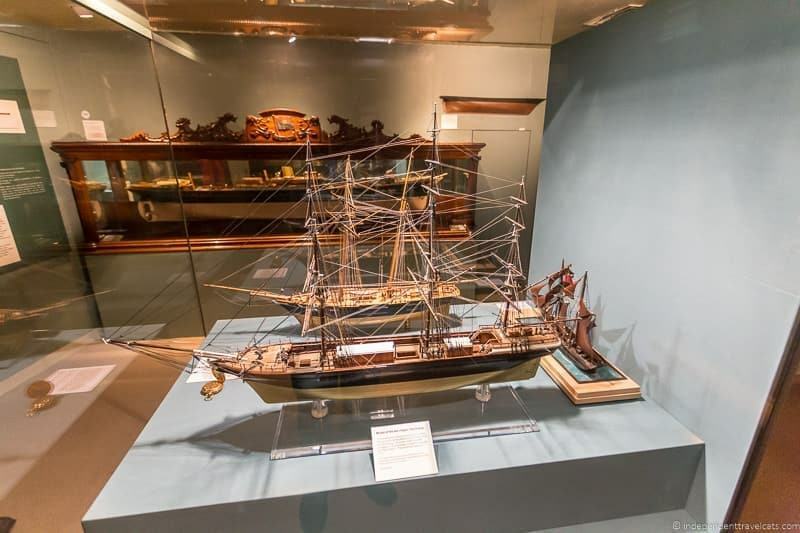 A good place to learn about the development of Aberdeen is the Aberdeen Maritime Museum, which is located near Aberdeen’s dock area. Aberdeen has a long and rich maritime history with fishing and shipbuilding being two of its former primary industries. The first harbor in Aberdeen dates back to at least the 12th century and the Aberdeen Harbour is believed to be the oldest existing business in the UK! Today the fishing and shipbuilding industries have been largely replaced by the shipping and off-shore oil industries which still keeps the harbor active. The museum tells the story of the city’s long relationship with the sea across 3 floors of exhibits. The museum covers everything from the beginning of the maritime industry to recent developments in the North Sea oil industry. The collection includes artifacts, maritime related art, and interactive exhibits. Part of the museum is in a modern building and a section is a historic building once lived in by shipowner Provost John Ross. The museum is free to visit. It also has a cafe if you are in need of a sandwich or coffee before or after your visit. 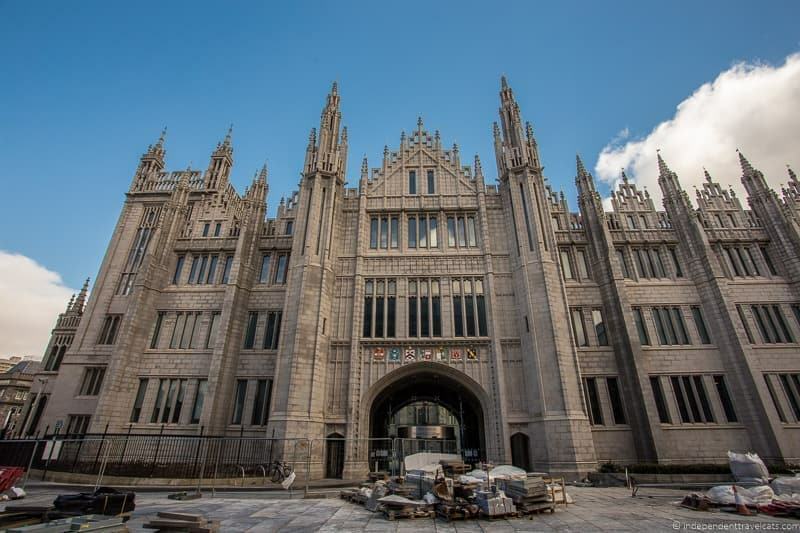 Marischal College was built in 1837 and served as the headquarters of the Marischal College and University of Aberdeen (now just the University of Aberdeen). The building was originally designed by Archibald Simpson and was later expanded and the front covered in granite by Alexander Marshall Mackenzie. The building is an interesting mix of styles and is huge. It is currently the second largest granite building in the world! The building has not been used as an educational building for many years, and is now the headquarters for Aberdeen City Council. There was a small amount of information on the history of the building here when we visited but not much else in terms of public visits. The interesting thing to do here for a visitor is to just to admire the long exterior as most of the interior is closed. The building can look a bit dull in rainy weather, but in the sunlight the building can sparkle silver. In front to the building is a statue of Robert the Bruce. Unfortunately there was a lot of construction going on around the square during our visit so we couldn’t get as close to the building as we would have wanted. Next time! 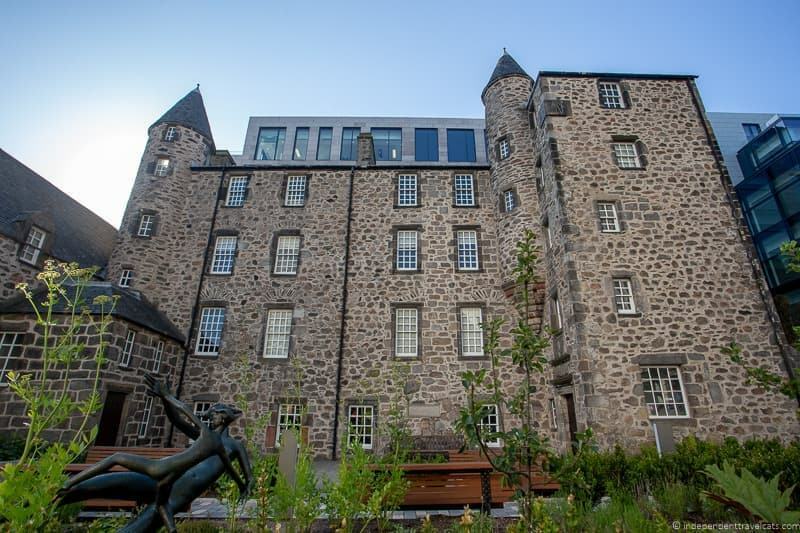 Provost Skene’s House is located near the Aberdeen Maritime Museum and houses a collection of furnished rooms that show visitors how people in Aberdeen would have lived in the 17th, 18th, and 19th centuries. The oldest part of the building dates back to 1545! The Tudor house was once the residence of the Lord Provost George Skene in the 17th century, which is where it gets its current name. The historical house has a number of interesting features included carved plaster ceilings, wood paneling, and painted ceilings, and the museum also holds a collection of art and costumes. The house museum is free to visit. 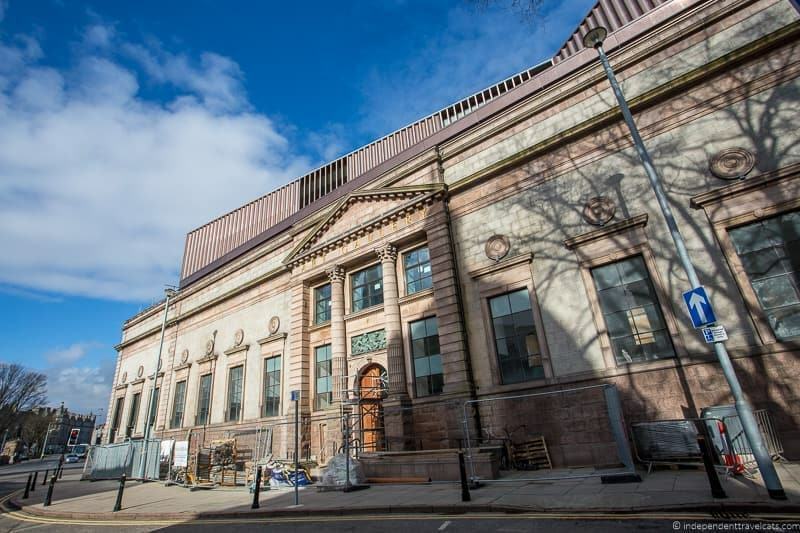 NOTE: Provost Skene’s House is currently closed because of construction work on Marischal Square, so please check the museum website for the latest opening details. The Tolbooth Museum is a museum located in one of Aberdeen oldest and most interesting buildings, a former 17th century gaol (jail). The museum focuses on local history, especially as related to crime and punishment over the centuries. The building in addition to being a jail, was also used for a number of other purposes, including as a town hall, a courthouse, and a council chamber. Despite its name, the building was not actually a tolbooth but was a Wardhouse which was located next to the former tolbooth. The museum provides an interesting atmosphere to learn a bit about the town history, medieval punishment, and town laws. 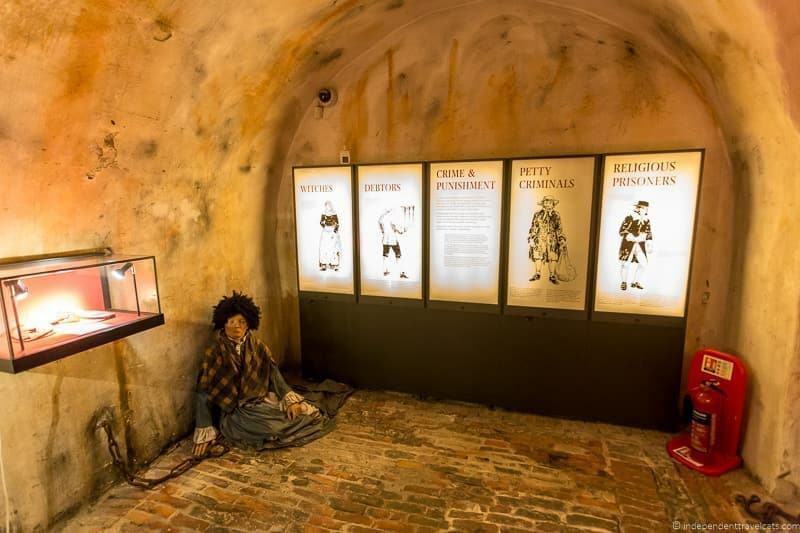 The museum provides thrilling stories of witches, the mass organized kidnapping and selling of children, prison escapees, and Jacobite prisoners who were interrogated and held after the Battle of Culloden. Some people believe the building to be haunted! The building still has many original features and items including jail cells, torture devices, and a 17th century guillotine blade. You can also the town’s original mercat cross here near the entrance. It is free to visit the museum. Note that the wax figures and stories of torture and punishment may be scary to young children. Also the museum contains a narrow, windy staircase that may be difficult for those with mobility issues, but there is a video presentation that can be watched near the entrance (ask at the entrance desk). Near the Tolbooth Museum is Castlegate Square, where Aberdeen Castle once stood. The castle was used by both English and Scottish troops (including King Robert the Bruce and King Edward I), and it is believed that it was destroyed by King Robert the Bruce in the early 14th century. There is nothing left of the castle, but in the square you will find Aberdeen’s mercat cross. The mercat cross denotes where the city was allowed to hold its market and it is where royal proclamations would have been announced. The mercat cross dates back to 1686 and was built by John Montgomery in sandstone. The large base is highly decorated with medallions representing 10 of the Stuart monarchs. The shaft is topped with a unicorn (the royal animal of Scotland). The shaft and unicorn are replacements but the original can be seen in the Tolbooth Museum. Peacock Visual Arts is a contemporary art centre, gallery, studio, print shop and digital studio located on Castle Street. The center promotes a variety of types of art in a variety of formats and provides a place for local artists to work and learn. 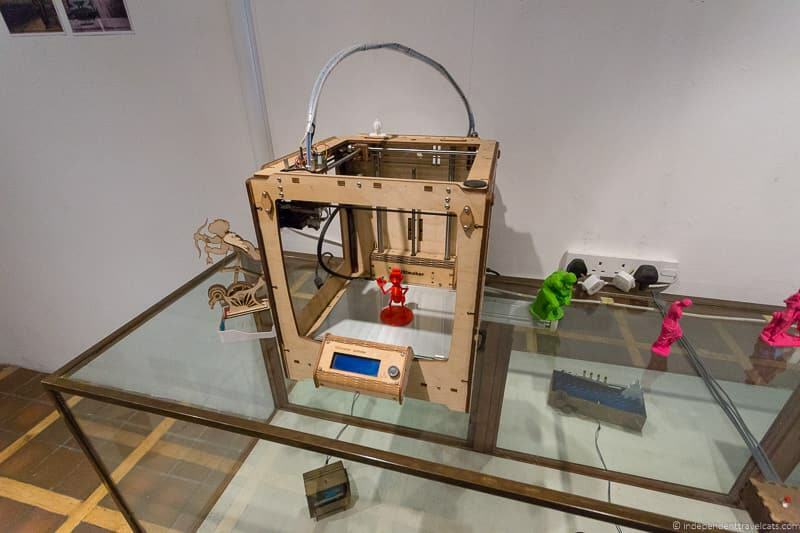 They also have hands-on art workshops (e.g., printmaking, using a 3D printer, etching techniques) as well as showings where you can buy local as well as international art. Although not a major tourist stop, it may be of interest to those with a passion for contemporary art and who enjoy checking out community art centers. We enjoyed watching a 3D printer in action as well as the activity in the print center. The center is mainly run by volunteers so if you are interested in visiting, it may be a good idea to contact them in advance as hours can vary. It is free to visit although there is a fee to join most of the workshops. 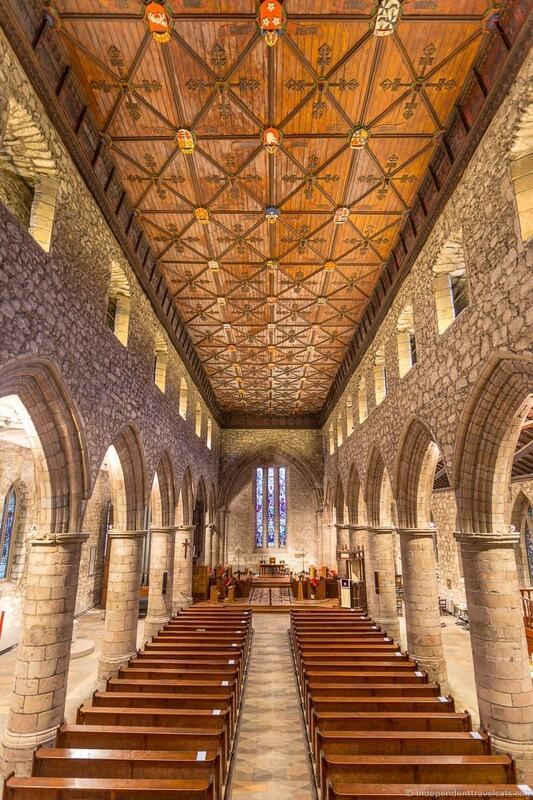 The Kirk of St Nicholas Uniting dates back to the 12th century and was likely one of the largest and most important parish churches in medieval Scotland. 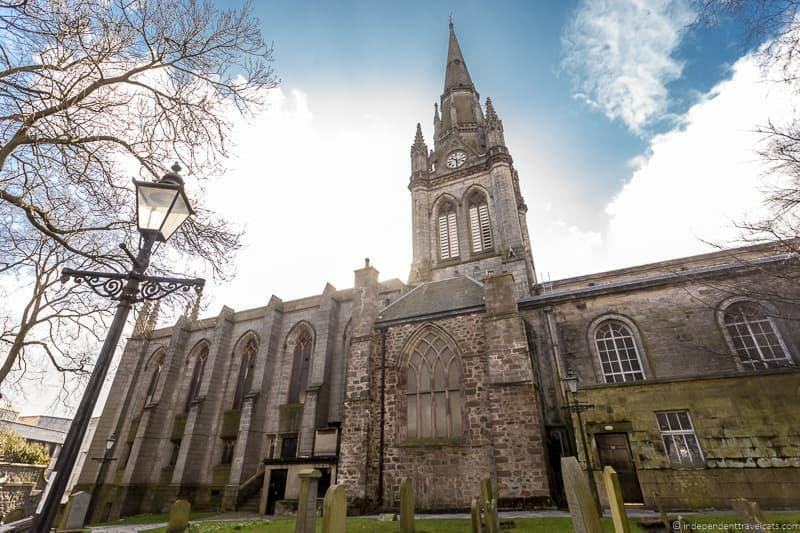 Today it has members of both the Church of Scotland and the United Reformed Church and is sometimes referred to as “The Mither Kirk” (mother church) of the city. Most of the present building dates to the 18th and 19th centuries as fires and decay destroyed the majority of the original medieval buildings. However, parts of the medieval church still survive and archaeological digs have uncovered structures, wood, decorations, tombs etc. dating from the 12th to 17th centuries. Archaeological work here is ongoing, and the church contains information about this work and findings. The church is free to visit although donations are welcome. It is regularly opened to visitors throughout the summer months, and visits can be arranged at other times of the year by contacting the church. The Aberdeen Art Gallery was founded in 1884 and is located in the city center in a building designed by Alexander Marshall Mackenzie. The large gallery contains a large collection of Scottish and international art, and is particularly notable for its collection of modern Scottish art. Entry to the gallery is free. NOTE: The gallery, along with Cowdray Hall and Remembrance Hal within the same complex, are currently closed for a major renovation. It is expected to reopen in 2019. The Union Terrace Gardens are a large sunken gardens located on the western side of the city center, near His Majesty’s Theatre. The park dates back to Victorian times and has an old viaduct located on one end. The park has a variety of trees, flowers, and grassy areas as well as public toilets and places to sit. 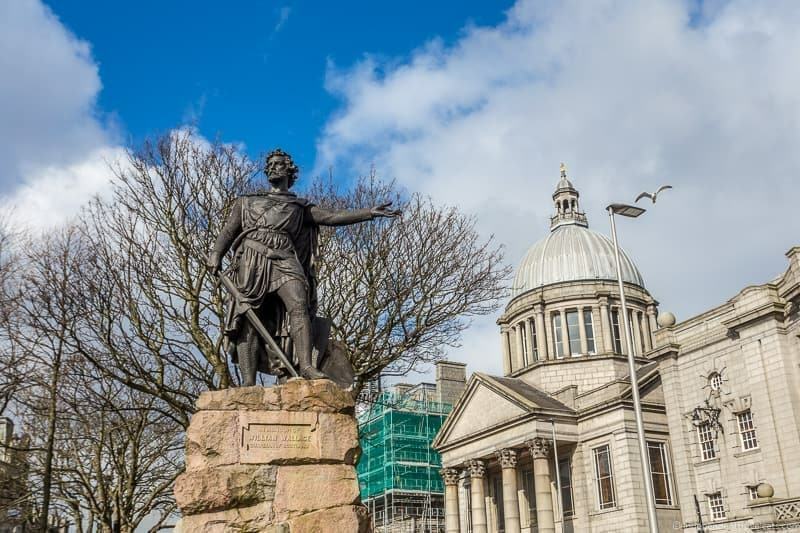 There are also a number of statues around the gardens, including a statue of Robert Burns along Union Terrace and statues of Prince Albert and William Wallace located across from His Majesty’s Theatre. It is a pleasant place to wander around or sit for a break in good weather. Concerts and other city events are sometimes held here. The gardens are currently undergoing a major development which will likely change their look over the next few years. 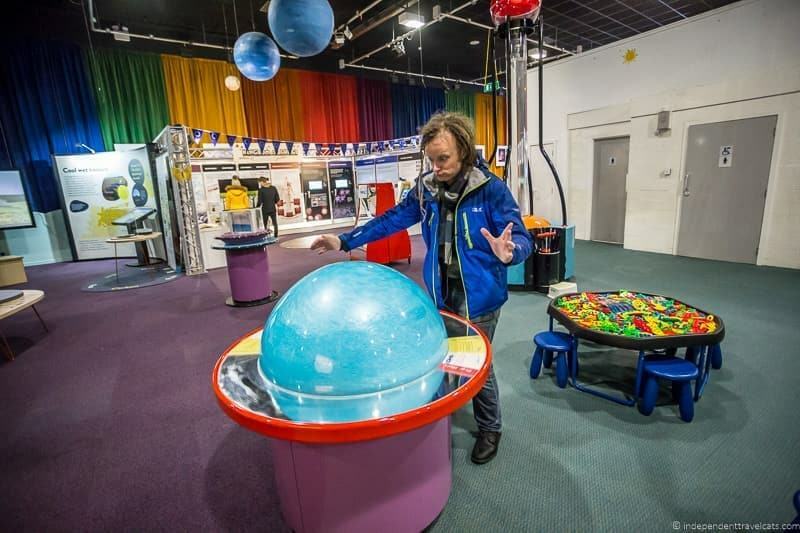 The Aberdeen Science Centre is a family science center that has a number of interactive science themed exhibits. They also have daily science talks and demonstrations that are free to join with your museum ticket. Exhibits cover a bit of everything from storms to gravity to music to insects, and there is something for every age group. The museum is fairly small, just one floor, so it is easy to visit even if you don’t have a lot of time. There is a small entry fee to visit the science centre. Next door is a cafe that serves sandwiches, snacks, coffee, and drinks. Aberdeen is one of the few major cities in the UK to have a sandy beach! There is a large stretch of golden sand along the eastern part of the city, although when we first visited in winter there was a storm so very little of the beach was visible. But on a warm sunny day, this a very popular place for people to stroll and hang out. There is also a grassy area next to the beach known as Queens Links. There are a number of attractions located at or near the beachfront, particularly for families. Along the Beach Esplanade is the city’s amusement park Codonas (includes amusement park rides, mini-golf, bowling, etc., some attractions are seasonal), restaurants and cafés (we can recommend the Sand Dollar Cafe), a cinema with 9 film screens, and an ice skating rink. The Kings Links golf course and the Aberdeen Science Centre (described above) are also located nearby. Note that you can of course swim at Aberdeen Beach although the water is never really warm. If you want to swim, paddleboard, surf, or do any other water sports you’ll want to bring or rent a drysuit or wetsuit. For those looking for a warmer family-friendly place to swim I’d consider going to the nearby Beach Leisure Centre which offers a large leisure swimming pool, wave machine, and sauna. The Aberdeen Beach is about a 15 minute walk from the city center. If you don’t want to walk, you can catch a taxi or bus to the beach. If you want to do a bit of shopping in Aberdeen, you can find everything from souvenirs to designer clothing. The city has a number of shopping centers located within the city center, including Union Square, Bon Accord, St. Nicholas, and Trinity shopping centers which offer a number of well-known fashion, beauty, and homeware stores as well as cafes and restaurants. In terms of good shopping streets, it depends on what you are looking for but Union Street (also known as the “Granite Mile”) is home to a number of well-known brands as well as independent shops, cafes, and restaurants. The Rosemount area of Aberdeen also has a number of smaller shops, cafes, and independent retailers. Festivals are a great way to learn more about the city culture, meet locals, and have some fun. There are a number of festivals in Aberdeen, and you should check before you go if there are any festivals happening during your visit. This year there are 10 official festivals being held in the city throughout the year, celebrating a range of things including performing arts, music, creativity, technology, dance, and old boats. You can check out the list of festivals and festival schedule here. There are also many other smaller festivals such as the Nuart Festival which celebrates street art. 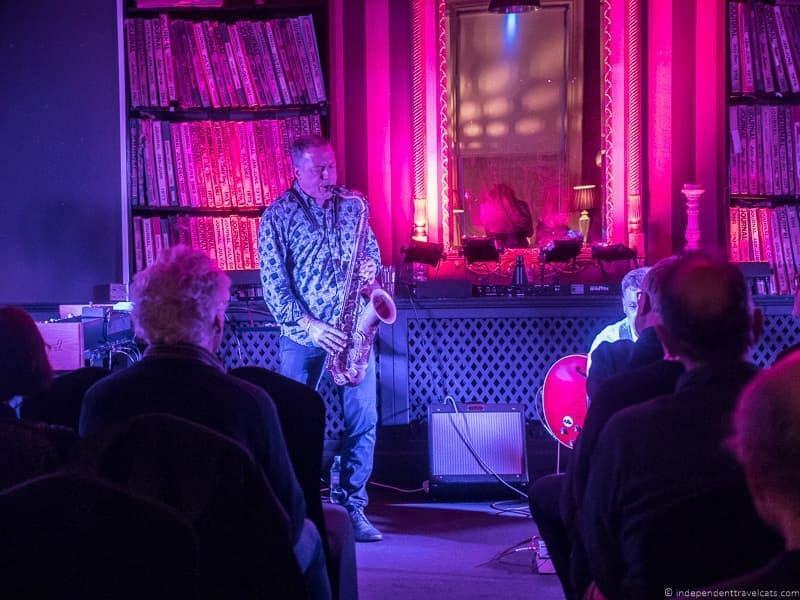 During our last visit to Aberdeen, the Aberdeen Jazz Festival was taking place, which was a 10 day festival with events taking place in multiple venues across the city each day. The festival included large free public events as well as smaller ticketed events. We saw three different Jazz Festival shows which included a saxophone performance by from Andy Middleton, an afternoon tea event with cocktails and vocal performances by the Vintage Girls, and a fun Saturday late night show from Fat-Suit and Werkha. Even if there are no festival events going on during your visit, there are also loads of other entertainment options. 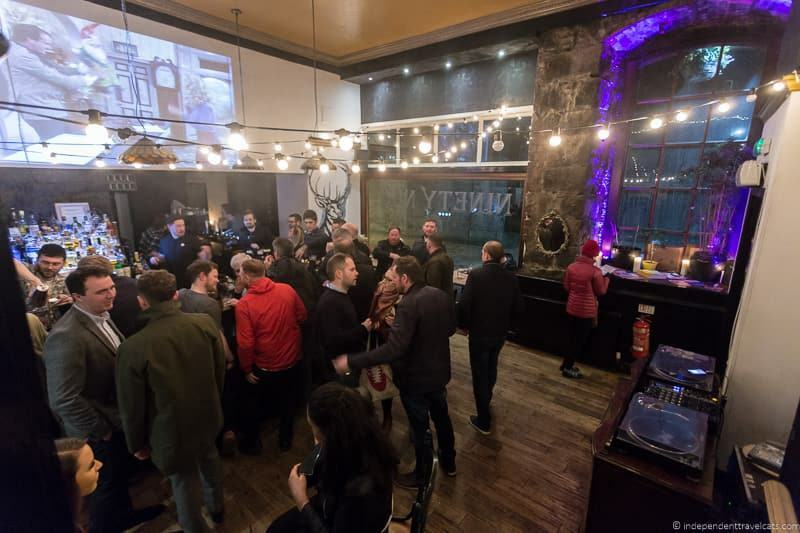 These include live music events, performances at the city’s theaters, comedy nights, cinemas (there are independent ones like Belmont Filmhouse and modern multiplexes), and of course there are a number of bars and pubs, as well as several nightclubs. For those looking to dance, some popular local nightclubs include Babylon, The Tunnels (located underground! ), ATIK, Underground, and NOX. For performing arts, check out this website for what’s one during your visit. Popular venues include His Majesty’s Theatre, Music Hall, the Tivoli Theatre, and The Lemon Tree. If you enjoy football (soccer), then you might want to join the locals for a match at Pittodrie Stadium to watch the Aberdeen Football Club play. Scotland isn’t exactly great at soccer but the games are still a lot of fun. You can check the match schedule and buy tickets online here. The stadium is about a mile from the city center, but the Football Club operates Park and Ride buses on home game days to take fans to and from the stadium. Old Aberdeen was for a long time a separate burgh and fairly isolated from the city, and it only become a part of the city of Aberdeen in 1891. Today the area is mostly made of the University of Aberdeen campus. If you have seen all the things you wanted to see in the city center, we’d recommend exploring this area next. Most of the attractions in Old Aberdeen are a 25 to 30 minute walk from the city center. So you can walk or take the public bus, drive, or take a taxi. If driving, be sure to pay attention to signs when parking as many parking areas are for university staff and students only. 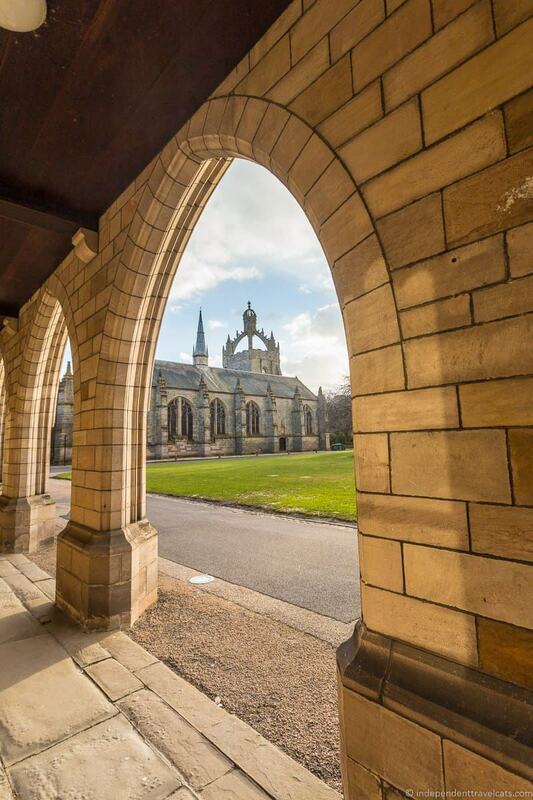 The University of Aberdeen dates back to 1495 and is the third oldest university in Scotland and the 5th oldest in the English speaking world! It was originally known as King’s College. 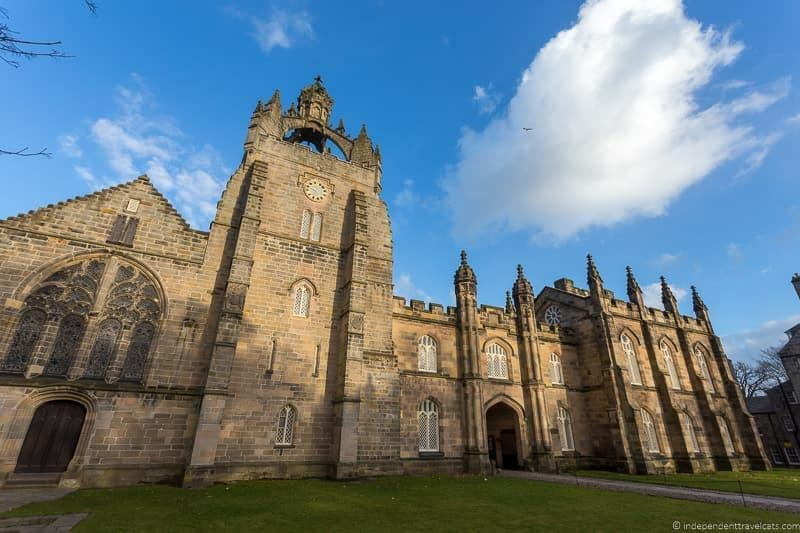 It is a high ranking university and its presence in the city, along with Robert Gordon University, means that Aberdeen has a large university student population. The university campus has a number of interesting buildings that date from the 16th century to today. The oldest building and one of the most notable is King’s College Chapel, which was built between 1498 and 1509, with its distinctive Crown Tower. The chapel’s crown has become a symbol of the university. Inside the chapel contains 16th century choir stalls and rood screen and the university’s war memorial. The chapel is open to the public on weekdays and is free to visit. Regular services are also held here. The King’s Museum is one of the university’s museums. The small museum includes rotating exhibits of artifacts from the university’s collection that are used to illustrate history related to local culture, the university, the people of Scotland, etc. The museum is located in the 18th century Old Town House, the former home of Old Aberdeen’s local government. The museum exhibits change every few months. Entry is free. Check the website for opening hours. The Zoology Museum is part of the University of Aberdeen and is located within part of the university’s School of Biological Science building. 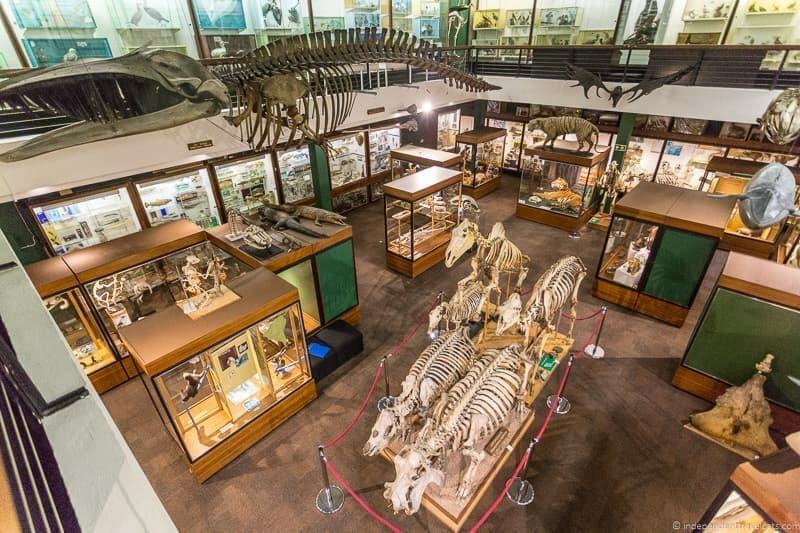 The museum consists of two floors of specimens, models, and displays that represent everything from protozoa to giant whales. It is not a huge museum, but there is a lot to see and is great stop for those who enjoy natural history museums. The museum is currently free and open to the public. It is closed on the weekends. NOTE: The university in addition to the two museums mentioned often has other temporary exhibitions or art spaces elsewhere in the university if you have a special interest. The Cruickshank Botanic Garden is located just behind the Zoology Museum. The 11 acre botanic garden includes a rock garden, a sunken garden, a rose garden, and an arboretum. A pleasant place to wander around and enjoy a break. It is open year-round and is free to visit. St. Machar’s Cathedral is the principal kirk, or church, of the Church of Scotland in Aberdeen. The present church (it is not technically a cathedral) dates to around the 13th century although it is said that St. Machar founded this site for religious worship in 580. It is the oldest building in active use in Aberdeen. The church is made of granite with large twin towers and is a good example of a fortified church. It also has an interesting interior with stained glass and a heraldic ceiling. The church is probably best known for its beautiful wood paneled 16th century ceiling that contains 48 coats of arms. The heraldic ceiling has three rows, one representing the kings of Europe, one the Pope and important members of the church in Scotland, and one representing the King of Scotland and the powerful figures within Scotland. Among the notable people buried here are Robert Laws, a Scottish missionary to Malawi and William Ogilvie of Pittensear. It is also believed that after Scottish knight William Wallace (the man Mel Gibson famously portrayed in the film Braveheart) was “hung, drawn, and quartered”, that one of his quarters (the left one) was sent and buried here at St. Machar’s! Entry to the church is free, although a donation is appreciated. The church also has a small gift shop inside, which is another way to support the property. Brig o’ Balgownie (formerly the Bridge of Don) is a stone arch bridge spanning the River Don in Old Aberdeen. 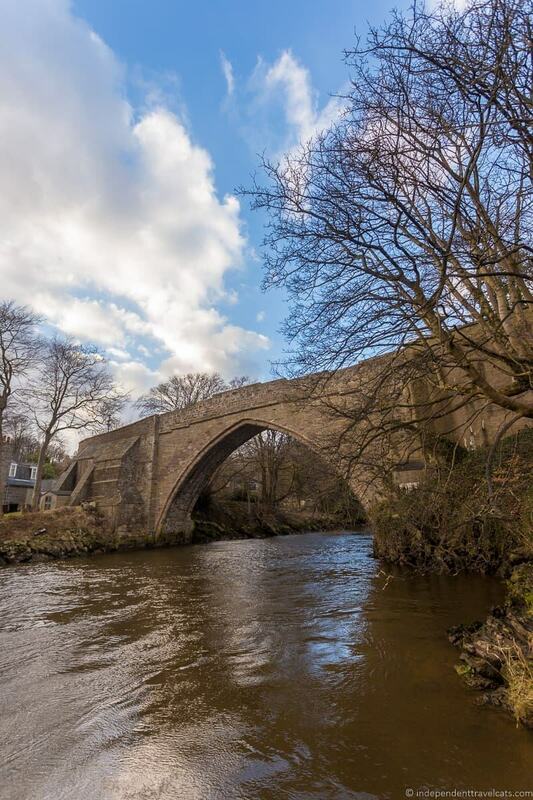 It is believed that the bridge dates back to the 13th or 14th century (making it one of Scotland’s oldest bridges), although most of the bridge we see today dates to the 17th and 18th centuries. The bridge was the main way to cross the River Don until around 1830 when the (new) Bridge of Don was built. Today it is a pedestrian bridge and local landmark. Although the true origins of the bridge are unknown, local legends say that the bridge was built by Bishop Henyr Cheyne and/or Robert the Bruce. Lord Byron mentions it in his poem “Don Juan”. If you want to enjoy this area further and have more time, I’d recommend taking the riverside path located next to the bridge to the sea. The area where the River Don meets the sea is part of Donmouth Local Nature Reserve which includes a beach area and part of the riverside. The riverside path starts on King Street, then goes to the the Brig o’ Balgownie, and then alongside the river to the seaside. We saw several water birds here as well as a seal. The bridge is located about a 20 minute walk from St. Machar’s Cathedral (or about a 45 minute walk from the city center). If visiting from the university area, you have a few options in walking there. You can walk across Seaton Park, walk along Don Street, or head along King Street until you reach the river and then turn left to join the riverside path to the bridge. If you don’t want to walk, it is about a 7 minute drive or taxi ride from St. Machar’s. If you are taking the bus, you can take it to Donmouth Road and then walk to the bridge (it is about a 7 minute walk from the Donmouth Road stop). 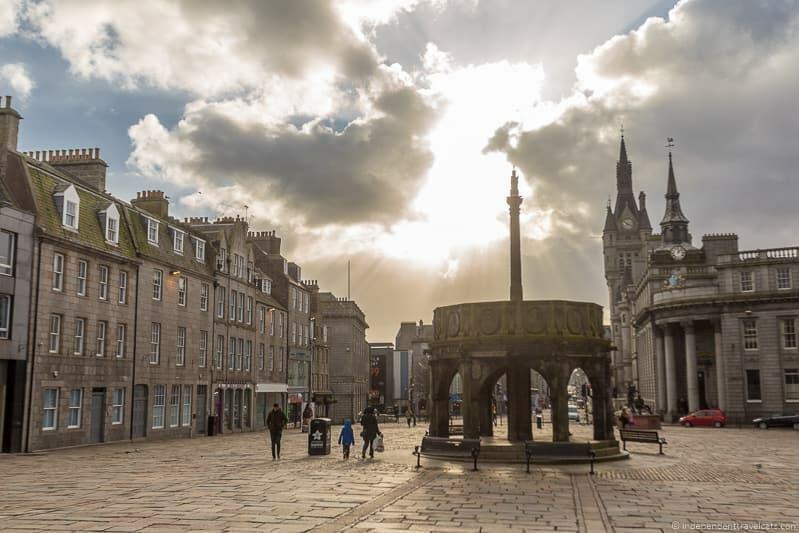 There are also a number of things you can do outside of central Aberdeen that are a 30 minute walk or further from the city center, including the Aberdeen Harbor area, war memorials, gardens, golf courses, and museums. Aberdeen Harbor is an interesting area to explore and we recommend a visit if you have good weather. The Aberdeen Harbour is believed to be the oldest existing business in the UK, dating back to the 12th century. However, the harbor is believed to have been in use since Roman times! Today the harbor is still a busy place with oil/gas ships, shipping, small cruise boats, and ferries heading to and from the islands of Shetland and Orkney. There is also a good possibility to spot dolphins and other sea animals in the harbor area. There are a few places around the Aberdeen Harbor area that might be of interest. 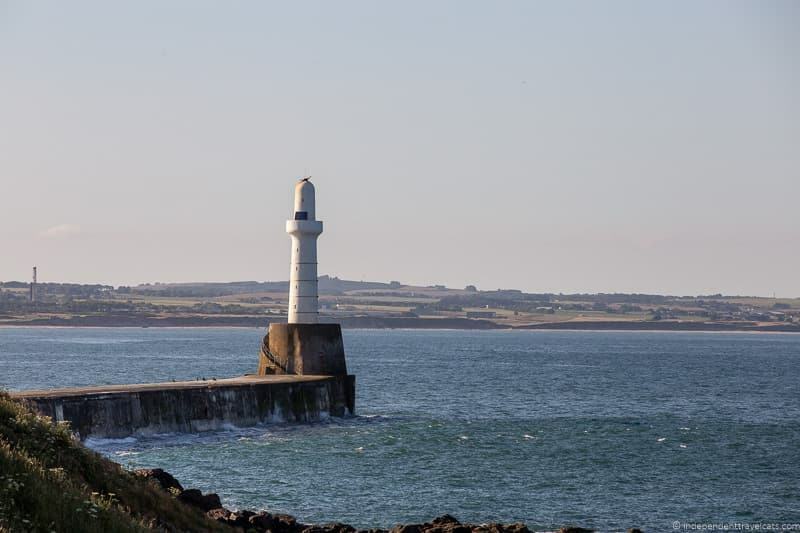 From the city center, the main Harbor area and Footdee are about a 30 minute walk from the city center, Torry Battery is about a 40 minute walk, and Girdle Ness Lighthouse is about a 50 minute walk. You can also drive, or take public transit part of the way to visit these sites. 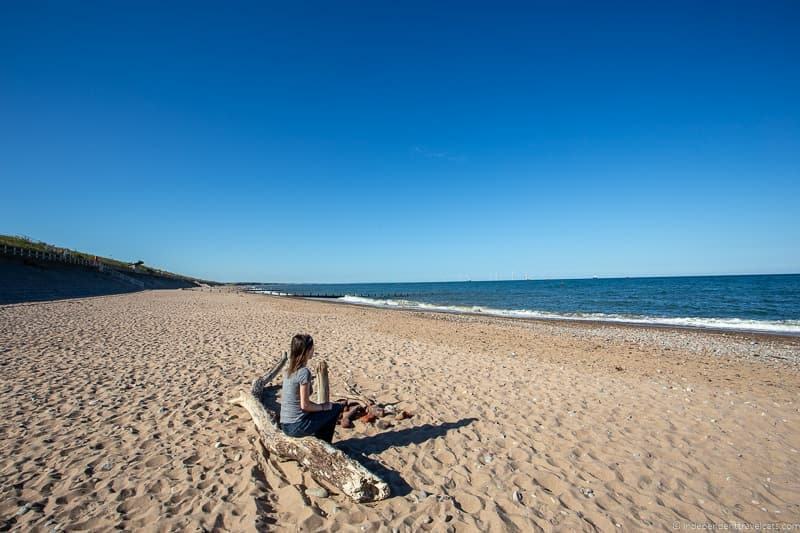 If you enjoy walking, consider taking this harbor hike around the Girdle Ness headland. Footdee, often referred to locally as “Fittie”, is a small community that was once a fishing village. In the early 19th century the area was redeveloped and a housing development was built to house the local fishing community. 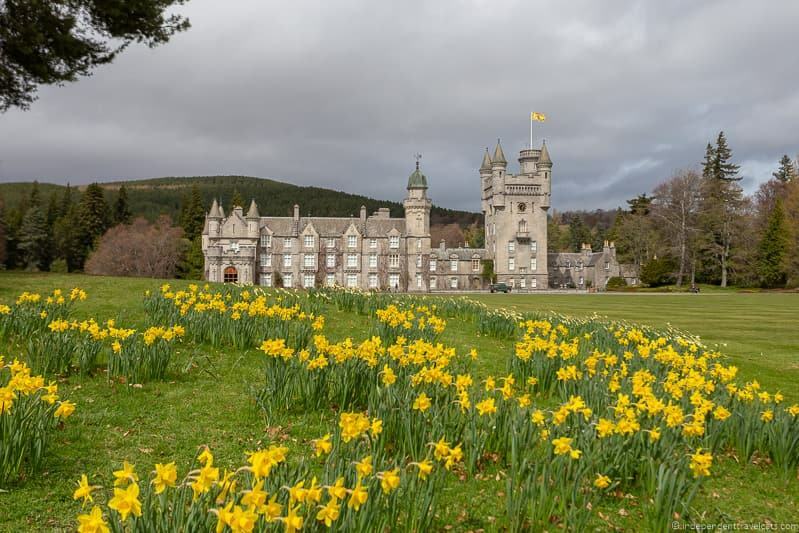 The architect who designed the layout was John Smith, a Scottish architect who designed many buildings and structures within Aberdeenshire, including Balmoral Castle. The initial homes consisted of 28 single-story thatched homes although that number was increased over time when further rows of houses were added. Each house has its own “tarry shed” which were originally all built out of driftwood. Today, the houses have expanded and many now have slate roofs and many of the sheds have been re-built from brick. However, it remains a charming area that feels a bit like a village from another century. Many residents have added a lot of personal decorations and flavor to their sheds! It is a small area and only takes a short time to walk around. Just remember when visiting that these are people’s homes and gardens, so be respectful of the residents when admiring their homes. Nearby next to the harbor are some interesting buildings and artifacts like an old anchor, the Roundhouse (the former 18th century Harbor Master’s Station), and the Old Customs House. The former customs house is a now a popular seafood restaurant called The Silver Darling which offers good views over the harbor. The Torry Battery is an artillery battery that was built in 1860 overlooking Aberdeen Harbor. 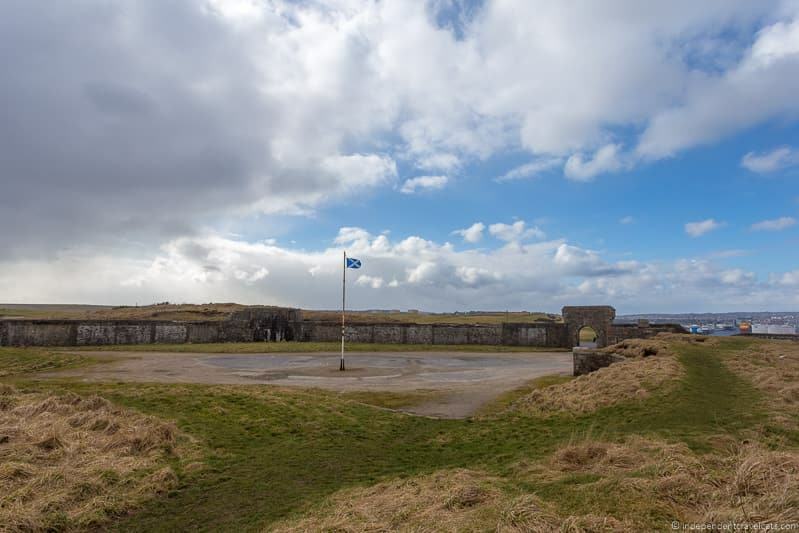 The battery was in use until 1956, including during World War 1 and World War II. It is currently in ruins but you can still see a lot of elements of the complex, including the entrance gate, sections of the walls, a gun emplacement, and barracks. Today it is a popular spot for walkers and joggers, and there is a small car park here if you are driving. It is a good place to get views over the harbor with a chance to see dolphins. If you keep walking or driving past the Torry Battery, you’ll find a couple of lighthouses. The first lighthouse is South Breakwater Lighthouse. It was built in 1815 and is still an active lighthouse. It is a good spot for dolphin watching, but be careful if you walk out close to it as it can be slippery and during storms the waves can entirely cover this area! The second lighthouse, Girdle Ness Lighthouse, was built in 1833. The engineer was Robert Stevenson, grandfather of the famous writer Robert Louis Stevenson. This lighthouse is also still in use. Many of the building in the Girdle Ness Lighthouse complex are privately owned and you can actually book to stay in some of the former lighthouse buildings. One is the former 3 bedroom lighthouse keeper’s cottage and while modernized, it contains many original period features from the 19th century. A great spot if you are looking for a quiet place and don’t mind being outside of the city center. Duthie Park is one of Aberdeen’s best green spaces and is a popular place for locals to enjoy the outdoors, especially on the weekends. 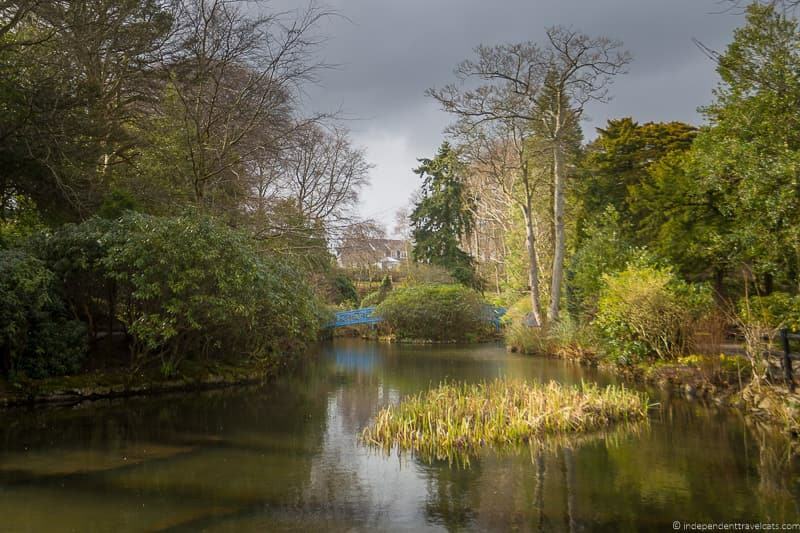 The 44 acre space opened as a park in 1883 (the land was donated by Miss Elizabeth Duthie) and contains open green spaces, trees, flower gardens, ponds, statues, a band stand, and the David Welch Winter Gardens. 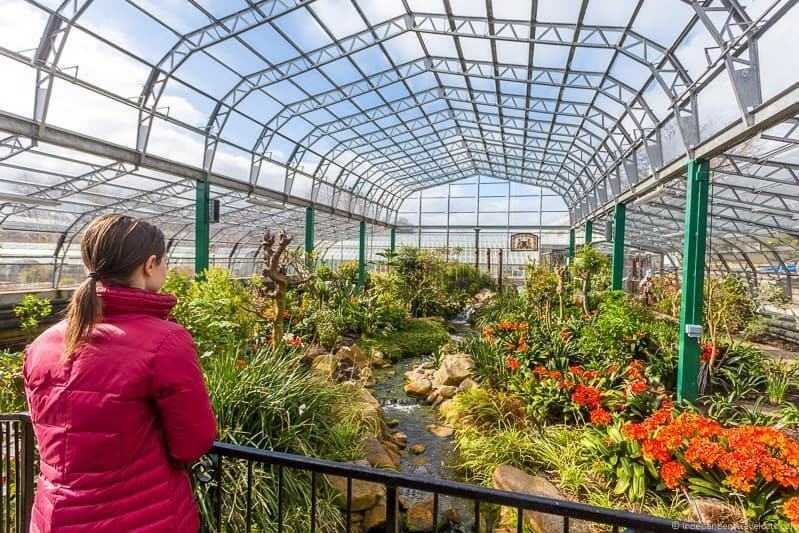 The David Welch Winter Gardens are located within Duthie Park and are one of Europe’s largest indoor gardens. The gardens includes arid and tropical glass houses and house a large collection of exotic plants. They are particularly notable for their large collection of cacti. We were surprised at how large this complex was and really enjoyed these gardens which are definitely one of the best botanic gardens in Scotland. Entry is free and it is open year round. There is a café, Duthie Park Café, located at Duthie Park that serves sandwiches, simple hot dishes, snacks, and drinks. Duthie Park is located about a 35 minute walk or 10 minute drive from the city center. 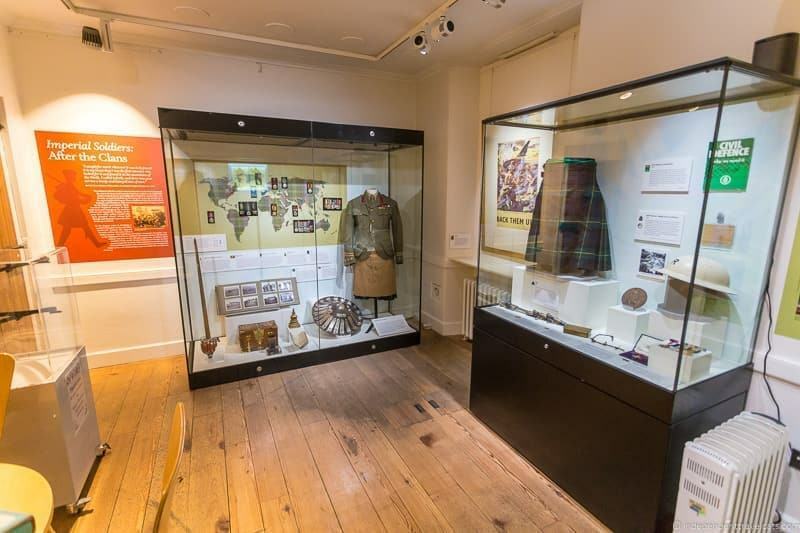 The Gordon Highlanders Museum presents the history of the Gordon Highlanders, a line infantry regiment of the British Army. The Gordon Highlanders have a history that dates back to 1794 when the regiment was raised by 4th Duke of Gordon. The Gordon Highlanders were an official regiment in the British Army from 1881 to 1994. The Gordon Highlanders headquarters were in Aberdeen and thus the regiment played an important role in the lives of many people from northeast Scotland. The regiment served in a number of wars and conflicts, including the Boer War, First World War, Second World War, and Cold War. In September 1994, the Gordon Highlanders were amalgamated into the The Queen’s Own Highlanders to form what is now the Highlanders. In reporting on the Second Boer War as a young war correspondent, Winston Churchill described the Gordon Highlanders as the “finest regiment in the world” based on his experiences observing them in action at the Battle of Doornkop in May 1900. The museum serves to preserve the history and legacy of the regiment and presents information, artifacts, and exhibits that tells the story of the regiment. Visits start with a film and then visitors can explore the museum on their own. 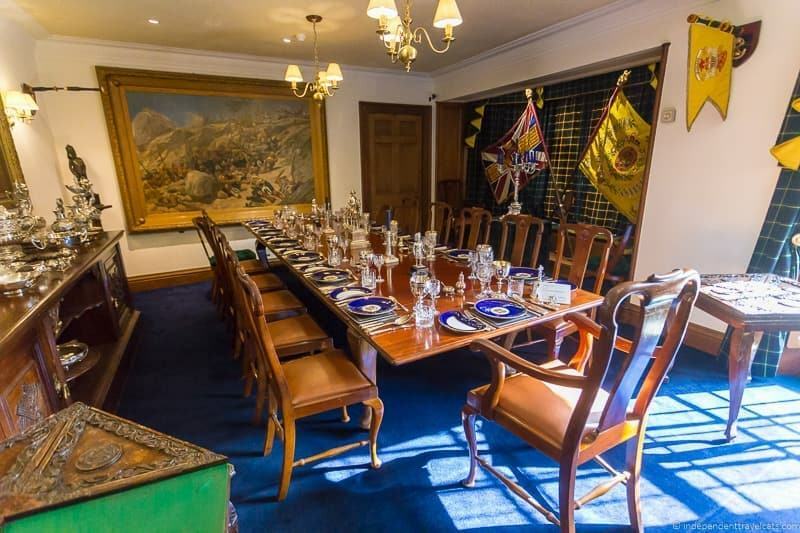 The museum includes interactive maps, a room filled with regimental silver, medals (including 11 Victoria Crosses), weapons, and a room set up as an officers’ mess room that includes a number of pieces of silver, china, and glass. The museum is housed in the former home of Scottish artist Sir George Reid. We had an enjoyable visit here and learned a lot; there was much more to see here than we expected. The museum is a registered charity and staffed primarily by volunteers who were friendly and eager to answer our questions and provide additional information. There is an admission fee to visit the museum. You can currently save 5% on admission by pre-purchasing your tickets online on the museums’ website. There is also a popular tea room on-site as well as a garden and gift shop. The museum is located about a 50 minute walk or 15 minute drive from the city center of Aberdeen. 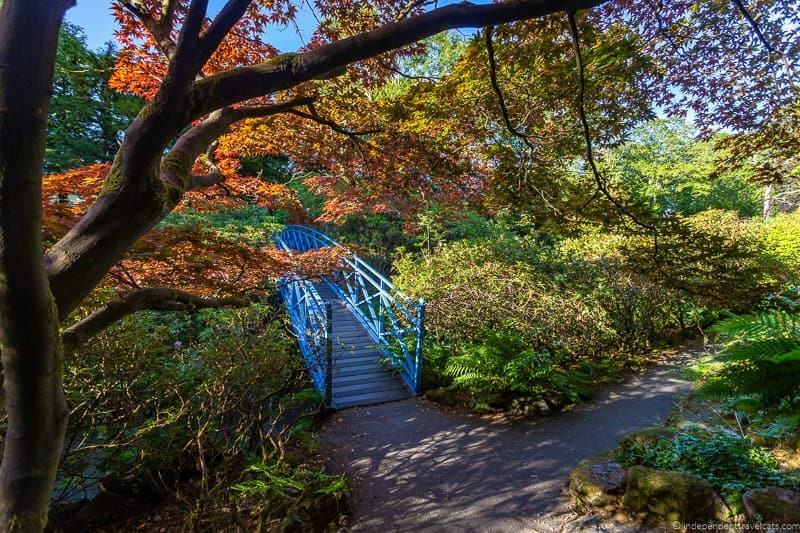 Johnston Gardens is a public garden that was designed and planted with aesthetics in mind. The garden includes ponds, streams, bridges, trees, and flowers and has won the Britain in Bloom competition (Aberdeen has won the award several times). The gardens also contain a play area for children. Unfortunately we did not have the best weather during our visit, but the gardens are a pretty place to wander around. 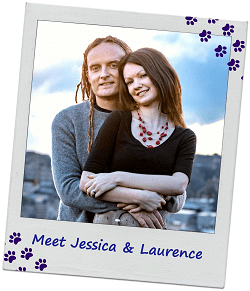 They are a popular local spot for engagement and wedding photographs. Entry to the gardens is free. 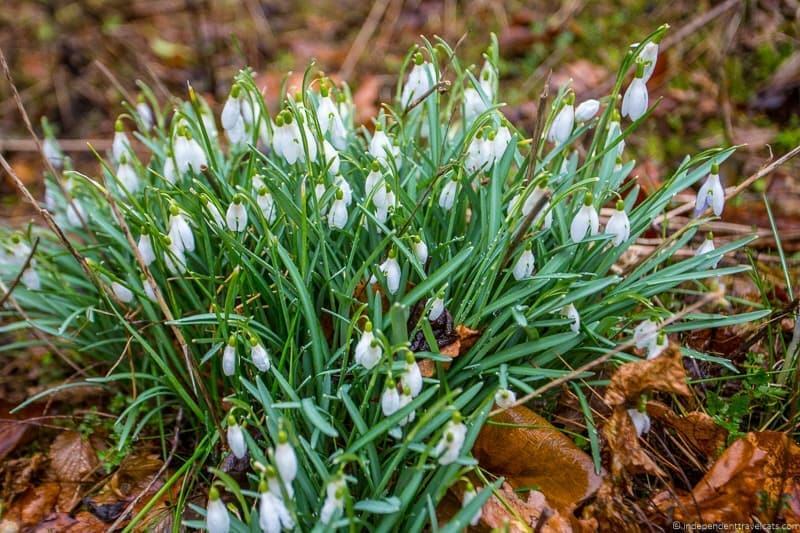 Located near the Gordon Highlanders Museum, the Johnston Gardens are about a 1 hour walk or 15 minute drive from the city center. The northeast of Scotland is where golf was invented and it is home to many of the world’s oldest and top courses.There are over 50 golf courses in Aberdeenshire, and we counted 8 golf courses located within the city of Aberdeen. So if you are a golfer you will have no difficulty finding a place to play and you don’t even need to leave the city! The city boasts golf courses suited to all levels from novices to pros, and you can find a list of courses here. One of the best known golf clubs in Aberdeen (and in Scotland!) is the Royal Aberdeen Golf Club which dates back to 1780, making it the 6th oldest golf club in the world. It has hosted a number of championship tournaments, including the Scottish Open in 2014. Next door is the highly rated Murcar Links. A few of the city courses are located within walking distance of Aberdeen city center (e.g., King’s Link Golf Course is a 17 minute walk from the city center). However, you’ll probably want to drive, take a bus, or get a taxi to get to most courses, especially if you have your golf clubs and gear with you. If you run out of things to do within Aberdeen, there are plenty of things you can do on a day trip from Aberdeen. These include golfing, visiting castles, whisky tasting, hiking, cycling, driving a scenic driving route, and birdwatching. If you don’t have a car, you can get to some places by bus or train, but you may want to consider a guided day tour as it will allow you to see more places as many don’t have good public transit connections. Two good places to check out day tours are Rabbies and Viator. 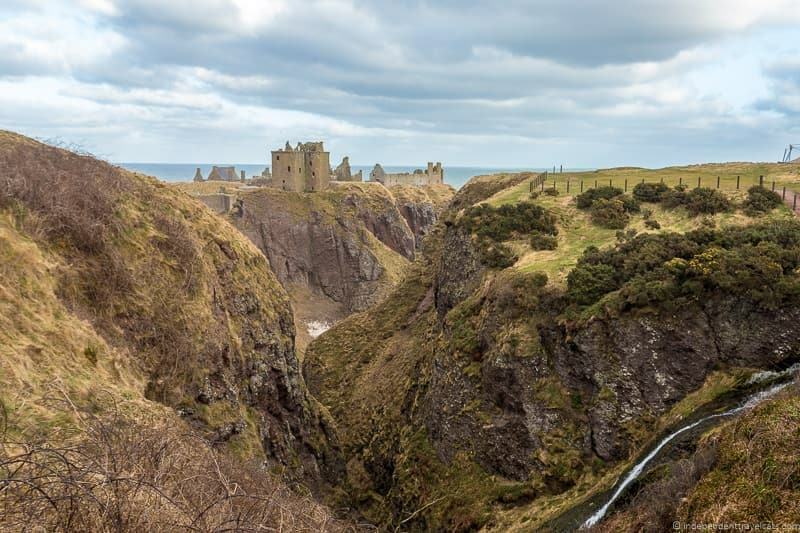 Possible guided day tours from Aberdeen visit Cairngorms National Park, Royal Deeside, Speyside Whisky Trail, Balmoral Castle, and Dunnottar Castle. If you are traveling with younger children, you may want to make a trip over to The Den and the Glen for a morning or afternoon of fun. It is a child-friendly park with indoor soft play areas and outdoor gardens that have been decorated with fairytale and nursery rhyme characters. A popular spot for local families. There is a cafe located within the park. The park is located about 20 minutes by car from the city center. Aberdeen is a great base for castle hunters in Scotland as there are loads of castles in Aberdeenshire and it is home to some of the most famous castles in Scotland. Some are privately owned and not open to the public, but many of the castles can be visited. You’ll find a bit of everything from grand residences to ruined rock piles, and everything in between. Many of the most popular castles in this area are owned by the National Trust of Scotland. If you plan to visit several National Trust properties while in Scotland (includes over 60 historical sites in Scotland) you may want to take a look at the Scottish Heritage Pass (valid for travel between April to October) which gives you free entry to a number of National Trust and Historic Scotland sites. Balmoral Castle – This castle was built by Queen Victoria and Prince Albert. It was completed in 1856 and has been the private Highland residence of the British Royal Family ever since. Although only a small section of the castle is open to visitors (the ballroom), the extensive gardens are fully open and there is an excellent audioguide that accompanies the visit here. If you don’t have a car, you can also join a guided tour from Aberdeen. Open to visitors during part of the Spring and Summer. Craigievar Castle – This pink harled Scottish castle dates back to the 17th century and was lived in as a residence until 1963. Today it is owned and managed by the National Trust of Scotland and open to the public. The castle still contains a number of original furnishings from the Forbes family. Visits are by guided tour only. Group sizes are limited so best to arrive early to pick up timed tickets. Open seasonally. Crathes Castle – This 16th century harled castle was the ancesterial home of the Burnetts of Leys until 1951. Today the house and gardens are owned by the National Trust for Scotland. Be sure to leave time to wander around the beautiful gardens. A GoApe treetop adventure course is also located within the castle grounds. Open year-round. Drum Castle – This castle’s tower house dates back to the 13th century, making it one of the oldest in Scotland. A large extension to the castle was added in the 17th century and then further renovations and changes were made during the Victorian era. Our favorite room here was the massive library. Managed by the National Trust for Scotland and currently open year round (except for over the Christmas holiday season). Dunnottar Castle – This ruined medieval castle sits on a clifftop alongside the coast. The buildings of the fortress date back to between 1400 and 1600. The castle was visited by famous people like Mary Queen of Scots, was where the Scottish Honours (Scottish Crown Jewels) were hidden from Oliver Cromwell’s army, and it was where a number of Whigs were held as prisoners in the 17th century. It has been in ruins since the early 18th century. It is currently privately owned but open to the public. If you don’t have a car, you can also join this tour from Aberdeen which stops at the castle and explore the Royal Deeside area. Note that many of the castle have seasonal hours and are closed in the winter months, so be sure to check the opening dates and hours before visiting. All of the above castles have designated parking areas and some are possible to visit via bus from Aberdeen. Kirkhill Forest is a forest located just outside of Aberdeen that has a number of multi-use trails, hiking paths, a orienteering trail, and a mountain bike fun park. Popular spot for local hikers, walkers, cyclists, and horse riders. Kirkhill Forest is located about a 40 minute drive from the city center. 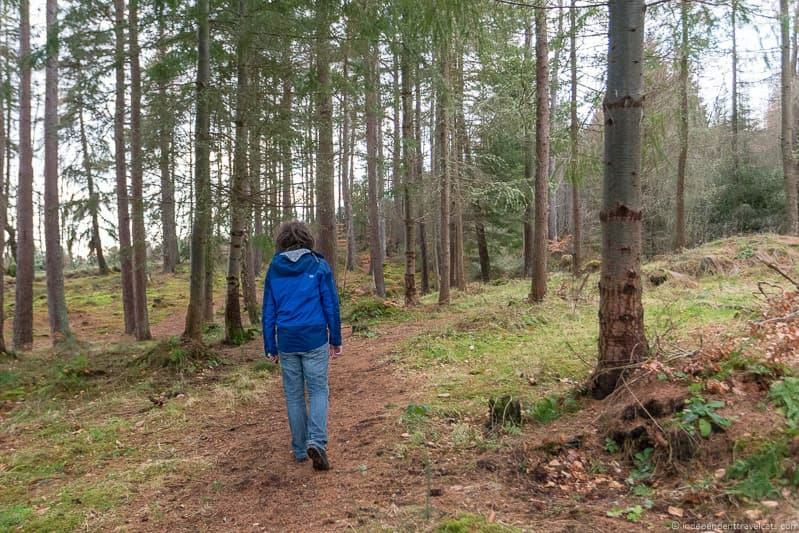 There are also many other forest areas within Aberdeenshire that you can explore. As noted earlier, there are over 50 golf courses located in Aberdeenshire! Aberdeen, which is home to several courses of its own, makes for a great base for golfing day trips for the keen golfer. The courses are set in a variety of locations. Many of the courses include sand dunes and coastal views, although you’ll also find courses located in town centers, forests, glens, near lochs, and even on castle grounds. There are courses well-suited for all types of golfers from novices to professionals. 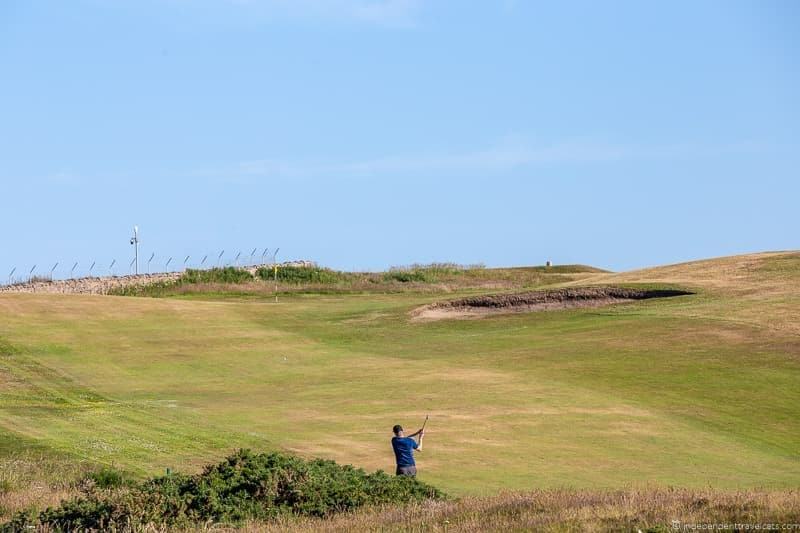 Some of the well-known courses in Aberdeenshire (outside of the city) include Cruden Bay Golf Club, Trump International Golf Links, Banchory Golf Club, Peterhead Golf Club, Fraserburgh Golf Club, Deeside Golf Club, and the 9-hole course at Balmoral. You can browse a list of the Aberdeenshire golf courses to find the courses that are best suited for you. You can also visit courses outside of Aberdeenshire and still use Aberdeen as a base. For example St. Andrew’s is only a 1.5 hour drive away from Aberdeen. It is recommended that you book your tee times, especially at the better known courses, as soon as you know the dates you wish to visit to avoid disappointment. Looking for a scenic and interesting driving route, check out the North East 250. It is a driving route that runs just outside Aberdeen and runs through Aberdeenshire as well as Speyside and the Cairngorms National Park. The route includes castle, whisky distilleries, natural attractions, beaches, museums, golf courses, and much more! Want to drive the entire route? Check out our 3 day North East 250 itinerary. Cairngorms National Park in one of two national parks in Scotland (the other being Loch Lomond & the Trossachs National Park), and the eastern part of the park is located within Aberdeenshire. The park is a perfect place for hiking, climbing, biking, scenic drives, birdwatching, wildlife, and even skiing in the winter! You’ll also find a number of castles, cultural sites, whisky distilleries, and family attractions located within the Cairngorms. It is about a 1 hour drive to the eastern edge of the park. You can also reach many of the towns within the park via bus (most are operated by Stagecoach). This guided small group bus tour from Aberdeen also visits this area. Whisky is the spirit of Scotland and Aberdeenshire and nearby Moray are home to several whisky distilleries. It is easy to spend a day (or two) visiting distilleries and tasting the local whisky. The closest whisky distilleries are Glen Garioch Distillery (only 30 minute drive from Aberdeen city center) and Royal Lochnagar Distillery (near Balmoral Castle). Aberdeen is also within about a 1 hour to 1.5 hour drive of several other famous distilleries, including Strathisla Distillery (home of Chivas Regal), Glenlivet Distillery, Glenfiddich Distillery, Cardhu Distillery (part of the Malt Whisky Trail), and Macallan Distillery. Most of the mentioned distilleries have visitor centers and do regular public tours, but some you’ll need to book in advance. So check the website or call them before stopping by. Also, note the Scottish drinking and driving laws are very strict, so almost all distilleries offer to-go sample cups for drivers and bikers. If you don’t want to drive, I’d recommend booking a driver or guided tour such as this guided small group tour or you can find a list of potential guides here. 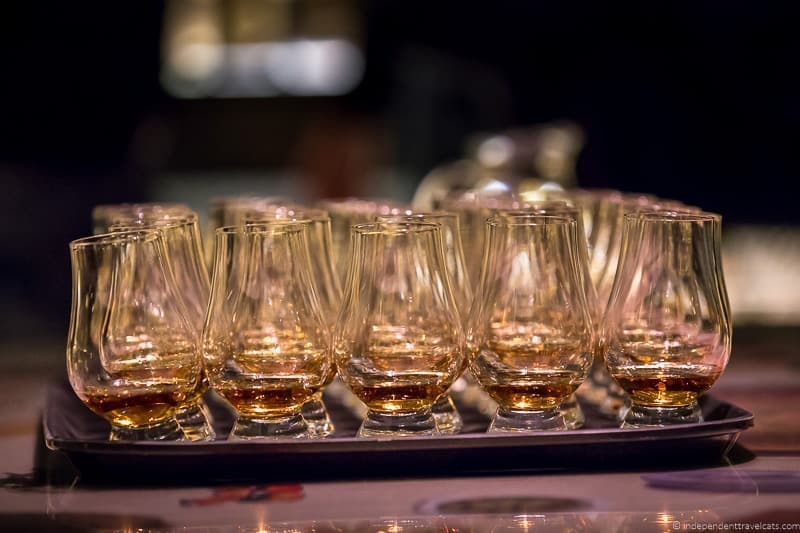 A guide can also help you learn more about the local whiskies and help you put together a customized itinerary. So there is our list of things to do in Aberdeen Scotland! Have you been to Aberdeen? If so, any favorites among the above or places you’d add to this list? If you haven’t visited yet, which of these Aberdeen attractions would make it on your itinerary? As always, feel free to ask us any questions you may have about things to do in Aberdeen or planning a trip to Scotland! This Aberdeen Scotland Guide is impressive to read. Thanks! This is truly everything one needs to know before going to Aberdeen. So much information in one post. Wow I didn’t realize there was so much to do in Aberdeen. It’s definitely on my list to visit on my next visit to Scotland. I love how the museums are free and the churches look really impressive. Of course, I would love to go to Balmoral even if you can only see a little of the inside. I honestly never imagined that there was so much to do in Aberdeen! How wrong I was! Love the Scottish history and architecture and have wanted to visit for a long time! I would definitely hit up some of the distilleries! Hi Lolo, The architecture in Aberdeen is really interesting and is tied to a number of significant Scottish and British architects. 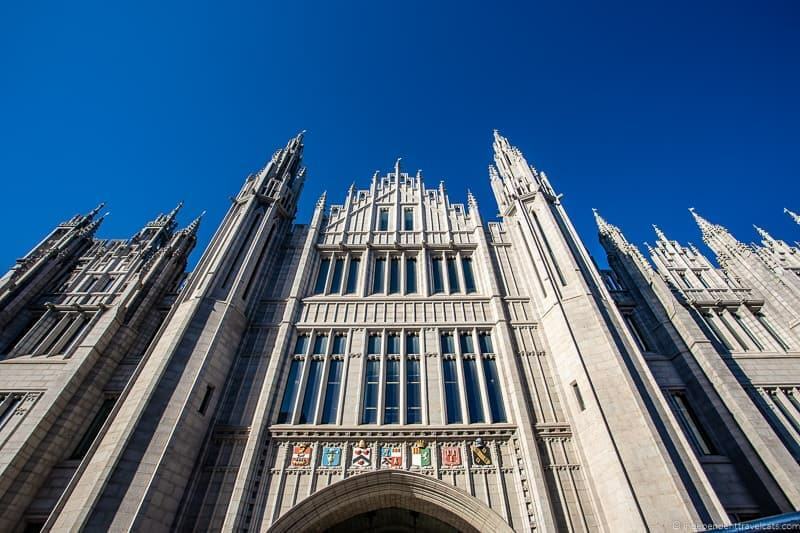 There is loads of history in Aberdeen and Aberdeenshire as Aberdeen has a number of old buildings and structures and the castles in region date back from medieval times to Victorian times – you’ll find connections to just about all the major events in Scottish history. I never heard of Aberdeen before, but I’m glad you introduced me to it. It looks like a wonderful place to explore and Scotland has been on my list for a long time now. Like always, your guide is extremely comprehensive, so I’m going to bookmark it. Thanks for sharing this, Jess. Really interesting to read about a blog post about somewhere other than Edinburgh! Aberdeen looks like an amazing place to visit with plenty to see, do and eat! I love maritime museums and try and visit these wherever I go. Love the museums and the beautiful architecture too! Need to get myself to Scotland! What an all-inclusive list! I think my favorite thing to see would be St. Macher’s Cathedral! 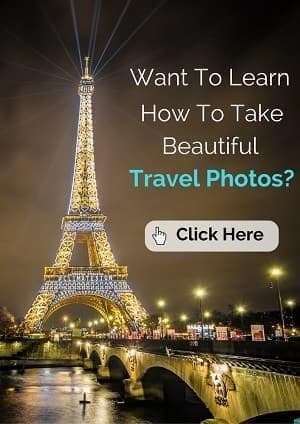 It’s stunning in your photos!! (Really fantastic capture and balanced light!!) Scotland is so high on my list of places to visit, but I don’t know that I’ve seen a good flight deal in years… I keep holding out hope that it will show up with some of the London/Manchester/Dublin deals that we tend to see a few times a year! Saving this guide for when it does! Hi Sara, Yes, St. Machar’s is one of my favorite places in Aberdeen as well, it is an interesting place with such a beautiful ceiling. If you are coming from North America, there are not usually cheap flights to Scotland, so you are better off probably looking for a good deal to London or Dublin, and then taking a cheap flight onwards to Scotland (Edinburgh, Glasgow, Aberdeen, or Inverness). Flights are generally inexpensive within the UK and Europe especially if you book in advance. Or you can train or bus from London or Manchester. It is about a 4.5 hour fast train between London and Edinburgh. Reading your blog has really gotten me interested in visiting Scotland. I was just telling my husband last night that we should plan a trip, and that I have this great blogger I follow who gives the exact kind of detail we need. So here is my question: if I’ve never been, and I have maybe 10 days, where should I go? Hi Seana! I am so glad that my articles have inspired you to visit Scotland. Of course, happy to provide advice. It depends a bit on your interests, what you like to do, and how fast/slow you like to travel, etc. so might be easier to chat via email. Then I can recommend more specific places. You can also search through my Scotland articles to get some ideas. But for a first time (and maybe only time visit to Scotland) I’d suggest 2-3 days in Edinburgh (the city is beautiful and a must-see with lots of attractions), 3-4 days in the Highlands, 1-2 days in Glasgow (or Aberdeen) if you like cities (both provide a nice contrast to Edinburgh), 1-2 days in one of Scotland national parks (Loch Lomond or Cairngorms) and perhaps choose an island or group of islands to visit for 2-3 days (the Isle Skye is the most popular but you have Orkney, the Shetlands, Outer Hebrides, Arran etc.). It really depends though on your interests and how you plan to travel (rental car, train, guided tour, etc.). If you or your husband like golf or whisky or clan history, etc. it could really change the above itinerary a lot. If you are looking for less touristy areas you might want to spend a day or two in the Scottish Borders, beautiful area with lots of ruined abbeys, lovely places to walk, and little historical villages.